Head to 14th Street to enjoy classic Cuban bites with beachy decor at Colada Shop. As the temperature rises, restaurants around the District are popping open umbrellas and dusting off patios. But outdoor seating at restaurants and bars can quickly fill up, and most picturesque spots are clustered in the same few neighborhoods. If you want to spend time outside, steer clear of popular outdoor spots in Georgetown and at The Wharf, and opt for a lesser-known spot where you are more likely to snag a table. If the end of the semester has you daydreaming of summer vacation, head to 14th Street to enjoy classic Cuban bites with bright and beachy decor at Colada Shop. The restaurant draws customers off the busy street with electric-red patio tables and an outdoor bar counter. The patio is also dressed up with pots of flowers in cheery colors and dangling string lights. 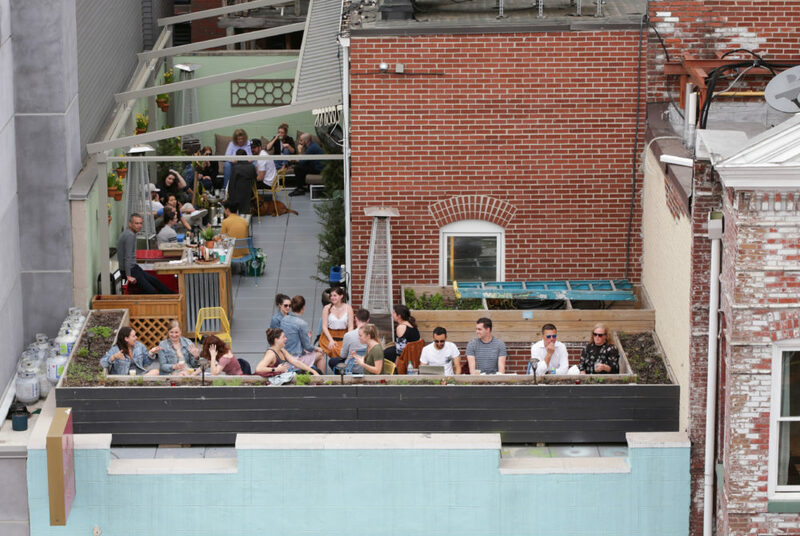 Seats fill up quickly on the patio and the outdoor bar, so customers can also head upstairs to a rooftop adorned with two cushioned lounge chairs and pastel-colored bar stools. Whether you’re on the rooftop or downstairs at the bar or patio, the menu includes authentic Cuban cuisine. Customers can choose a traditional Cuban sandwich stacked with salty ham, slow-roasted pork, Swiss cheese, mustard and pickles and cilantro aioli on Cuban-style bread ($12.63) or pass around some plantain chips ($2.24) with friends. You can also enjoy drinks like the “Hotel Nacional” ($8) with rum, apricot liqueur, pineapple juice and apricot lime puree or a classic pina colada ($8) with white rum, coconut cream and pineapple that will make you feel like you are on vacation. Zorba’s Cafe in Dupont Circle dishes out Greek food with expansive sidewalk seating. 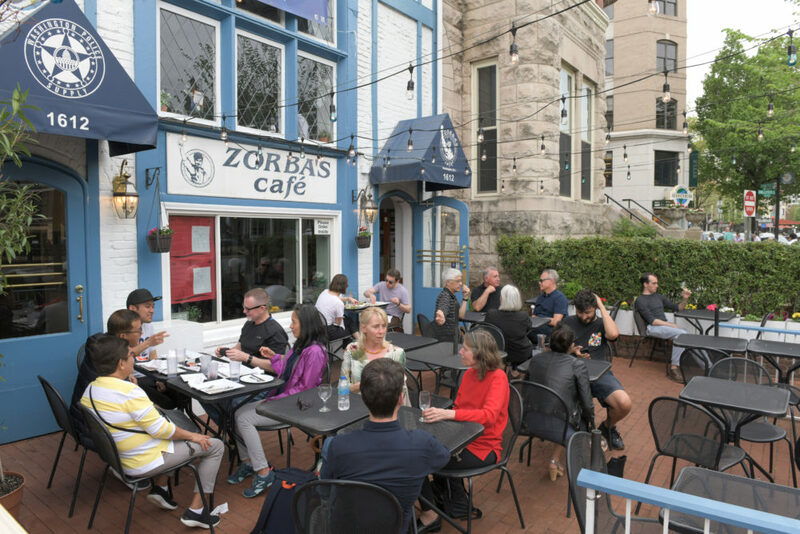 Just a short walk from campus in Dupont Circle, Zorba’s Cafe dishes out Greek fare on expansive sidewalk seating. The cafe is painted blue and white to stand out from the other buildings on 20th Street and enclosed with a brick sidewalk patio with more than a dozen black metal tables. For warmer days, the restaurant opens up navy- and white-colored umbrellas to shade customers from the sun and turns on string lights around the patio when the sun goes down. During the day, dozens of people gather on the sidewalk area to feast on Greek dishes like terokafteri ($5.95) – a whipped feta cheese served with red pepper and pita – and chicken shish kebabs ($13.50) skewered with tomato, onion and bell pepper and served with rice and a house-made roll. The scents of Greek cuisine waft around the sidewalk, drawing in customers who may not have even realized they were hungry. You can also sip on the cafe’s cheap beer and wine options like Zeos ($4.75), a Greek beer, or Kourtaki white wine ($4.25). If you snag an outdoor seat with a group of friends, order a pitcher of Stella Artois ($18.95) or a carafe of Kourtaki red wine ($21.95). You can sit outside and grab a slice at Sonny’s Pizza in Park View. The newly-opened pizza place in Park View may seem like a spot for a quick bite, but Sonny’s Pizza has outdoor seating options that will make you stay awhile. Throughout most of the year, the restaurant’s red and white retro sign welcomes customers into an old-timey restaurant with blue diner-style booths and a bar. But when the weather warms up, Sonny’s Pizza brings out long wooden bench tables that can fit a large group of friends. The menu offers Italian classics like Sicilian cheese pizza ($3.75). If you are looking for a heartier option, the restaurant also offers sandwiches like chicken and eggplant parmesan ($12) topped with gooey cheese and marinara sauce and served on sesame focaccia bread. You can also split dishes like the towering caesar salad ($6) or garlic knots ($5), which are served alongside a small bowl of marinara sauce. If you head to the restaurant between 5 and 7 p.m., you can take advantage of happy hour deals, which include “Raised by Wolves” beer ($4) and glasses of red, white or rose wine ($7). You can also purchase beer pitchers for $20 or a carafe of wine for $27. 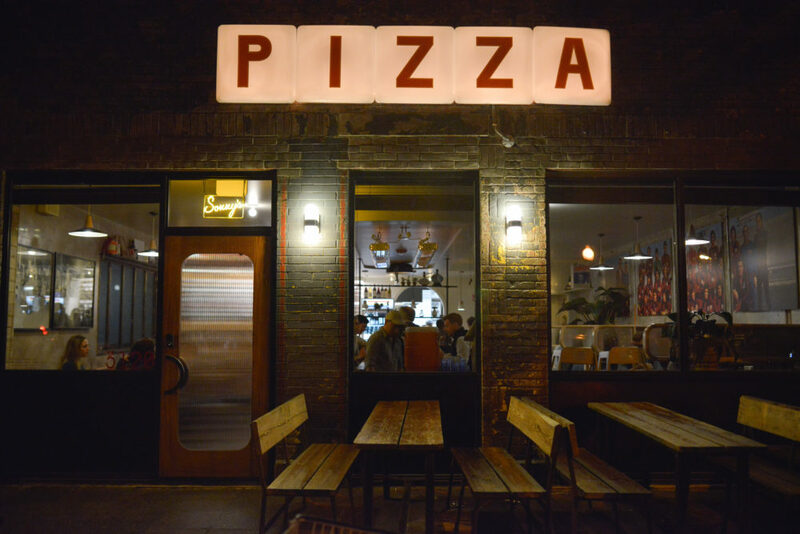 Even if you can’t grab a seat at one of the outdoor tables, Sonny’s Pizza’s sister restaurant Colony Club is just one door down and offers even more outdoor seating options on its patio. American Ice Company offers classic barbecue dishes. If you are feeling nostalgic about backyard barbecues at home, American Ice Company has an ideal setup. 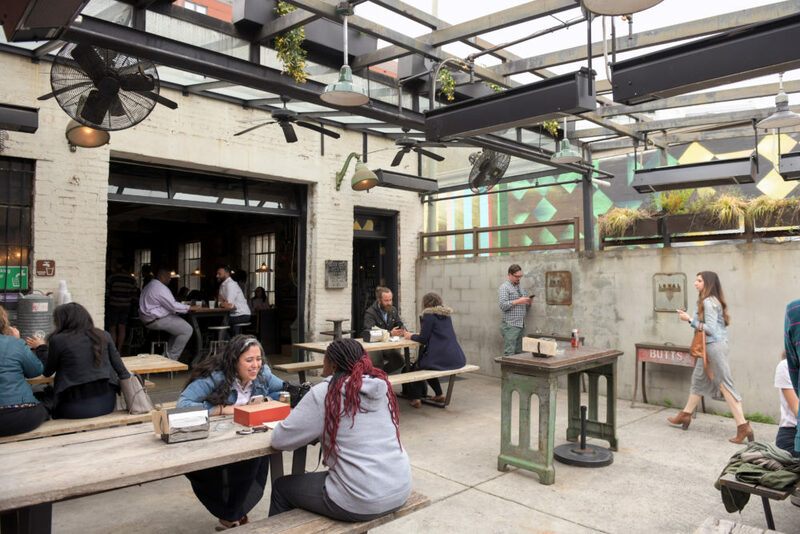 The bar’s back porch, which features exposed brick walls and picnic tables, welcomes crowds of customers for tasty barbecue fare. You can bring along a group of friends and sit at one of the restaurant’s seven long wooden tables underneath a glass skylight ceiling. The restaurant also turns on fans when the weather is hot and space heaters if the evening gets chilly. American Ice Company serves traditional options like pork, chicken and brisket, which can be served on a sandwich ($10) or a platter ($13) with coleslaw and beans. You can also choose three sides from options like chips and queso, mac and cheese or corn bread for $10. On a warmer day, you can camp out at one of the picnic tables and share pitchers of Narragansett lager ($23) or Bell’s winter ale ($26) all day long.